Some light from the rising sun is coming in through small windows set high up on the eastern wall, bathing the scene in a general warm glow. The other light source is the angelic glow surrounding Gabriel. Zechariah & the angel Gabriel. This is the fourth scene in this “Births foretold” series of Bible cartoons. I have done quite a lot of research into what the temple of Herod might have looked like, what the priests wore when ministering in the temple, & what was inside the Holy Place, which we can see in the above scene. Zechariah’s job was: 1) to remove the ashes of previous incense burnt, 2) to collect hot, burning coals from the altar of burnt offering (outside in the temple courtyard) & to bring them in and place them on the golden altar, 3) to sprinkle the new incense on the hot coals and 4) while the smoke ascended, to make intercessory prayers on behalf of the people. Notice also that the walls are covered in gold plates, much like the outer porch walls. We can see Zechariah is very surprised by the sudden appearance of the angel Gabriel; so much so that he is dropping a gold jar of incense! I’m very pleased with the way this Bible Cartoon has come out. The angel Gabriel is based on other angels I have drawn, but I am pleased with his wings, the clothing folds, hair, etc. 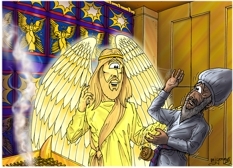 The decorative hanging behind the angel Gabriel is the veil or curtain which separates the Holy Place (the room where Gabriel & Zechariah are) from the Most Holy Place. The design for that curtain is outlined in the Old Testament; this is my version of it. I first designed this version for my cartoon of Mark 15 – Death of Jesus – Scene 02 – Temple curtain torn, which shows the miraculous tearing of the veil/curtain at the time of Jesus’ death on the cross. 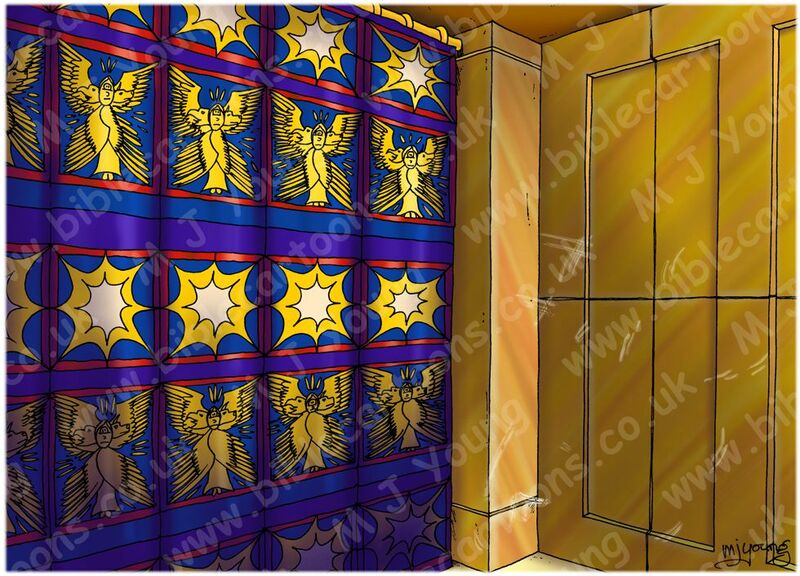 I was keen to make the two curtains identical in design, to maintain continuity between my Gospel illustrations. Position of objects in the Holy Place. In the holy place were the altar of incense (by the veil/curtain, the table of shewbread (against the north wall, behind Zechariah), and the seven-branched golden candlestick (against the south wall, to the left of the scene).